If you’re setting out to build the best PC you can muster, you’ll want to make sure you get the best motherboard possible. Motherboards aren’t as exciting as the best graphics cards or processors, but that shouldn’t matter. Your motherboard serves as the backbone of your PC, helping your hardware reach its full potential by pushing it to its limits – utilizing and optimizing every inch of performance. Basically, you can overclock better with a high-quality motherboard. The best motherboards are extremely important to your PC build, so it only makes sense to get the best motherboard you can find. If you cheap out and get a sub-par motherboard, it could die and force you to rebuild your entire computer from scratch – and that's not a good time, trust us. 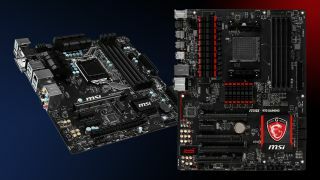 So, do yourself a favor and pick up the best motherboard right now, so you don’t have to replace it later. When Coffee Lake Refresh CPUs hit the market, Intel promised that they would be the best processors for gaming, and we knew that meant kitted out motherboards were on the way. And, lo and behold, the Z390 Aorus Gaming Pro Wifi – the best Intel motherboard on the market right now. It’s packed with gaming-centric features like reinforced PCIe slots and enough RGB lighting to blind you. It’s hard to find a better motherboard, especially at this price point. Sometimes, when you’re shopping for PC hardware, inundated with all the different features, components and requirements, you just want to throw your hands up in the air and say “just give me everything.” In times like these, a motherboard like the Asus ROG Maximus XI Code Z390 Gaming is your best bet. Packed with every feature that Intel’s new Coffee Lake Refresh processors support and then some, with a RGB-lit shroud covering every inch of circuitry on this motherboard. Now that Coffee Lake Refresh has been on the market for a while, you’ll want to take advantage of all the power it has to offer. However, high-end motherboards can get pricey fast. So, if you’re looking for a budget option without many compromises, the Gigabyte Z390 should be at the top of your list. It doesn’t have bells and whistles like RGB lighting and built-in Wi-Fi, but it makes up for these compromises with excellent value. You get all the essential features that Z390 has to offer for a great price. If you’re looking to build a budget gaming system, the Gigabyte Z390 UD is the best motherboard for you. These days, small form-factor PCs are all the rage and with motherboards like the ASRock B450M-HDV, we think they’re going to stay that way. Now, while this motherboard doesn't do SLI and supports only up to 32GB of RAM– it is a B450 unit, after all – it is still compelling due to its low price. Outside of these omissions, you still get a slot for a NVMe SSD and four USB 3.1 Gen 1 ports around back. If you’re looking to build a solid budget gaming PC, this is going to be the best motherboard for you. The X-series processors are here and they're spectacular, so if you want to take advantage of all they have to offer, you need an X-series motherboard. This ASRock X299 is an excellent choice, with support for overclocked memory speeds up to 4400MHz(!!!) and 8 different slots for memory modules. It also supports up to 128GB of RAM, so with an X-series processor and a good graphics card (or 3…) this thing will absolutely tear apart anything you throw at it.